I’m reading a book right now called Get Gutsy and I’m up to a part about building your dream team. Those who support your life and business. Something clicked with me; to be on my dream team, you have to work with me, not against me. Logical, but hard to do. To be on my dream team, you need to hear my crazy (and constant) ideas and go “awesome, how will we do that?” Instead of “no, you can’t do it that way”. It sounds so simple, written out like that. So simple. And yet, it’s very, very rare for that to happen. What I think it boils down to is logical support. Realising that what works for them might now work for you and being able to support you to find what you really need to make your goals happen when they hear them. This is not the same as blind support – it’s a hard to find balance of supporting crazy ideas through plans, and honesty when something really doesn’t suit you. It’s hard to find the people who fit this grey area. I am so very lucky to have a couple of friends who are my dream team. They never blink at my ideas but also give me honest feedback on achieving my dreams. while still supporting me. If it sounds confusing…it is. Life is. I think some of the best teams are pretty small. Quality over quantity and all that. It’s a hard one to wrap your head around, and one I’ll be thinking about more. Many people are superficially supportive but in reality they aren’t a true supporter. It’s kind of like that business/pricing example I’ve heard a lot recently: Don’t worry if you can’t afford your product/service; you are not your ideal client. Your friends may want you to succeed but think more about their abilities than your own. My husband is my dream team, outside of that, I’m not sure. I think the key to a dream team is finding kindred spirits with complementary skills. You don’t all have to be the same, but you all need to bring something to the table. I have found the most wonderful connections through blogging and social media. Look around and it’s amazing who pops out of the woodwork! I have made the best friends with those complementary skills since I started blogging. It’s honestly been the best part! Such a thought provoking concept. My dream team… a few come to mind. It’s interesting when you actually think about who gives you true support. It filters it down fast. It’s good to have people you can really nut out ideas with. 1. Jamie Oliver, because he knows how to keep going when it gets tough, he’s full of bubbly energy and he’s passionate about good food for ALL demographics- no money? Can’t cook? No judgement from that guy! 2. Richard Branson, because even though he’s filthy rich he doesn’t seem to make it matter. I follow him and go yeah, I can have fun and be successful and it doesn’t matter if I’m not a millionaire. 3. My bestie, who’s currently also my beta reader and kciks my but into gear when I slack off. 4. My marriage celebrant (weird much) because she’s clever and passionate and a bit quirky, but she has a heart of gold (created a charity to fund white weddings for terminally ill and is very vocal about marriage equality). Also she has good taste in wine. What a great mix of people! 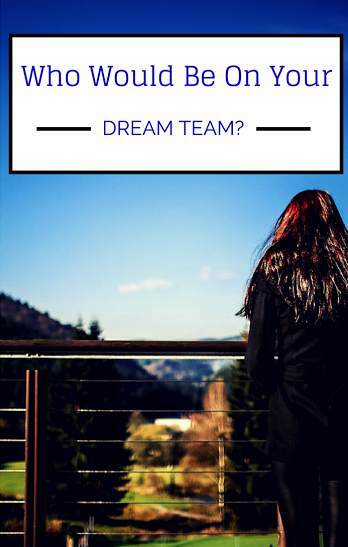 My Dream Team consists of my husband (Head Cheerleader, though I’m not sure he’d wear the short skirt and shake the sparkly pom poms – we can negotiate on that), several close amazing girlfriends and some super fabulous bloggy mates. Honesty is key, yet so is positivity and being open minded. A sense of humour is also a must and the ability to enjoy a celebratory tipple. Cheers! It is so heartbreaking when you have a dream and it gets shot down by your closes friends. Good idea to find people that are supportive. And close friends may not be the best people for your dream team. Friends might not have the right education or industry knowledge to truly understand your idea – if people are unfamiliar and it looks hard to them, I do think they shoot it down in their heads but verablise it at you. My husband is on my dream team and various friends and family members, depending on what I need support in. I’m a big believer in going to people with experience and the temperament to help you in that moment, not going back to the same people with the same ideas and sometimes very little practical advice to give. I like that you include the people with the right temperament in this. So important! Interesting concept and question. I think I need someone who would be an advocate or mentor for an autistic person (me), but also push me out of my dream world a bit as well.. No idea who that person is, though. My Mum and Mick do kinda sorta fit here, but need someone who isn’t family as well. Hope you find your dream team if you haven’t already! I feel like a total lone ranger most of the time. Making art is quite a solitary life – for me. I am really not sure how to put together a dream team, and yet I know that so much more could be accomplished. Do I need to read this book…?